Planting season is here. Whether you're a seasoned gardener or a novice, a new study is raising a red flag about some of the products you might be using. Researchers for the Ecology Center, a nonprofit environmental group tested nearly 200 common garden products and found two-thirds of them contained significant levels of one or more toxic chemicals they ranked of "high concern." The data was published on the website HealthyStuff.org. In garden hoses, gloves, kneeling pads and a variety of tools like shovels and trowels researchers found a number of toxins including lead, phthalates and bisphenol A or BPA. Phthalates are chemicals used to soften plastic. They are considered endocrine disrupters which interfere with the body's hormone function and some studies have linked them to adverse developmental issues and birth defects. BPA is another toxin used in plastics from water bottles to dental sealant. In fact, many of the chemicals found have been linked to birth defects, impaired learning, liver toxicity and other serious health issues. "This is another example of people assuming that products on the shelves that they're buying are safe, when infact they're largely unregulated and full of chemical hazards," said Jeff Gearhart, Research Director at the Ecology Center. "Even if you are an organic gardener, doing everything you can to avoid pesticides and fertilizers, you still may be introducing hazardous substances into your soil by using these products. The good news is that healthier choices are out there. Polyurethane or natural rubber water hoses and non-PVC tools and work gloves, are all better choices." Ninety different types of hoses and 53 different gloves were tested. In both products, lead and phthalates were found at levels that exceeded standards set by the Consumer Product Safety Commission (CPSC). Researchers focused on garden hoses to see if there had been any improvement from previous studies. For example, in one test they bought a hose, filled it with water and set it outside in the sun for 72 hours. "We found lead migrated from the hose into the water and we found lead at a level 18 times higher than the federal drinking water standard," Gearhart said. "We found BPA in the water at a level 20 times higher than the safe drinking level. We also found the phthalate DEHP at a level 4 times higher than the federal drinking water standards. But Neal Langerman, Ph.D., Office of the Division of Chemical Health and Safety at the American Chemical Society, says what consumers aren't told is how low the risk truly is. "They always do their studies in such a way as to obtain as high a concentration of the chemical of interest as they can," Langerman said. "This group generally does not discuss risk. They present the hazard and they leave it at that. The closest they get to addressing risk without ever using the word is in their suggestions for reducing exposure. Such as don't drink out of a hose. Or run the hose for a couple minutes before you use the water. Those are perfectly reasonable recommendations. They happen to be risk-based but these groups never talk about risk, so the average person does not get an appreciation for the risk -all they get is the hazard and that's a very one-sided approach." Gearhart says the water hose findings were the most significant and his biggest concern. "Gardening products, including water hoses, are completely unregulated and often fail to meet drinking water standards that apply to other products, yet again demonstrating the complete failure of our federal chemicals regulatory system," said Gearhart. "Our children will never be safe until we reform our laws to ensure products are safe before they arrive on store shelves." HealthyStuff.org's recommendations to consumers are: Read the labels, avoid hoses that contain the chemical polyvinylchloride or PVC. They also recommend buying hoses that are safe for drinking water and lead-free; and that you store your hose in the shade. "We know that temperature can increase the release of the chemical from the hose," Gearhart said. As for gardening gloves and tools, Gearhart says avoid any that are vinyl or have a vinyl coating. There's been plenty of ongoing controversy over the chemical BPA. The FDA has done extensive research and reviewed hundreds of studies on the chemical. They have maintained that to-date the scientific evidence does not suggest that very low levels of exposure through diet are unsafe. But on March 30, 2012 they issued an interim update on BPA. That update says in part: "Studies employing standardized toxicity tests have thus far supported the safety of current low levels of human exposure to BPA. However, on the basis of results from recent studies using novel approaches to test for subtle effects, both the National Toxicology Program at the National Institutes of Health and the FDA have some concern about the potential effects of BPA on the brain, behavior, and prostate glands in fetuses, infants, and young children. In cooperation with the National Toxicology Program, the FDA’s National Center for Toxicological Research is carrying out in-depth studies to answer key questions and clarify uncertainties about the risks of BPA." So in the meantime,the agency says, it will take "reasonable steps to reduce human exposure to BPA in the food supply." Langerman says when using these products, the solution is simple–and common sense. "Wash your hands. Read the recommendations and follow them as deemed appropriate. 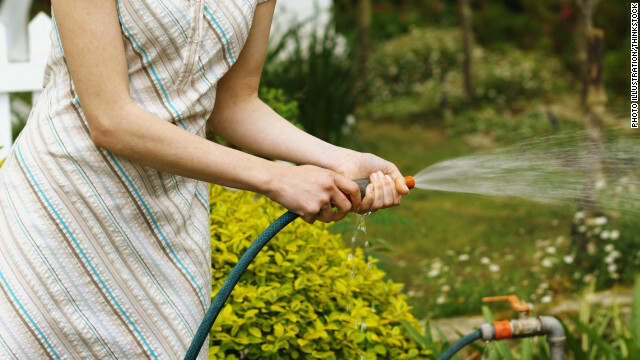 If a consumer thinks a particular type of garden hose is worth the extra money than do it. But if you're not using that garden hose to water vegetables for human consumption the additional money is just not of benefit. If you are using it for human consumption, its probably worth the additional money to use a garden hose that's certified for use for drinking purposes and pay the additional costs." Are food isnt safe to eat, its a given that other things would be more dangerous. If you kill people fast your a murderer kill them slow and make a profit your an entrepreneur. Bob–I agree 100%. It is high time we start looking at what is being sold to us, and get these things regulated by a protective government agency. HEY–More JOBS!!! You got it Bob. 2012 is here and already happening–not with a bang but a whimper. We have a tiny little garden, not much, but I can trust that its pure and organic, make my own compost, etc, but now I'm probably watering it with BPA and phthalates. Can we just live our lives without being subject to poisons in everything?? Bob, it really should be "Our food isn't safe to eat" . Somebody send bob a dictionary, please! Let me get this straight, if you want to use a garden hose for drinking, you should buy one that is "safe for drinking water"? Wow, I need Gov't or watchdog groups to tell me this? No mention of all the germs/mold/slime in hoses that sit outside all year half filled with old water? This is why more regulations rarely work. People just stop using common sense. So now they will pass some regulation that every garden hose has to be drinking water safe? Great. Just more of my money gone so some moron gets protected from themselves. Another example of TOXIC MADE IN CHINA products because 99percent are made there. Made in China = poison for man and beast. 72.3% of all statistics are made up. I believe this is one of them. They have had PVC garden hoses here long before we traded with China (before we lifted trade barriers). You can buy drinking water safe hoses, if you cannot live without drinking from a hose that sits out all year. We don't buy them because they cost 3 times more. Even as kids we knew to run the water through them for a while before drinking from them. (Way back when we didn't know any better). In this case we simply need to educate people not to drink from them. Even the ones marked drinking water safe can have all sorts of germs in them. Would you drink from a cup that you leave outside for a year without sterilizing it? Flatsguide, you are having a hard time understanding that alot of our durable and not so durable goods including garden hoses, garden tools and garden wear are made in China? You have evidently been drinking from the garden hose too much – statistically speaking. No they are not dangerous. They merely contain some toxic chemicals. That does not mean those chemicals get into your body. Plasticizers that are used in water bottles leach into the water and then you drink it. Bad ! Chemicals that leach into your garden hose water, gets into you only if you drink from the hose, before the running water washes it out. Remember you fertilize your garden with manure and all of it (100%) contains e-coli. But generally you don't get sick from this. I will accept the data from the testing without question here; but I cannot infer any "risk" or "harm" from those sprayed out in garden hose water. This is pretty silly. Standards for drinking water assume long term high volume consumption and are not relevant to water used for plants etc- the fraction of these chemicals that will ultimately pass into the food chain is tiny. Also there is no indication that BPA and pthalates transfer with much efficiency by intermittent skin contact. This article is needless hysteria! I totally agree! But what about people who like chewing on their garden gloves and knee pads?? There's no hope for them, but they're so tasty!!! This explains the strong plastic taste when drinking from a garden hose...which I did many times as a kid in the 1970s...always thought something wasn't right about that but adults said it was ok. Many of today's chemicals didn't even exist then...not sure if I want to keep filling our baby pool with a lead filled/phthalate laden hose. No it's probably safer now to drink from the garden hose than in 1970. No telling what was put in them then!! Who drinks hot water from a hose that's been sitting in the sun all day? Thirsty kids who are playing outside. As a former thirsty kid who often drank from a hose, I would always let the water run until it turned cold. I guess some thristy kids like their water scalding hot and plasticy tasting? Yeah 120 Degree water is sooo refreshing!! Once the hot water has run out of the hose, the cooler water reduces the temp down to 50-70 degrees pretty quickly. or whatever the water temp is in the lines. Water is a great conductor of heat. The ones most likely to be exposed long-term to toxins from hoses are pes and livestock. But kids do drink from hoses, whether or not they've been told not to. That is a big concern, especially if there is lead leaching out. "Healthystuff"? sounds like a new front for the "EWG" kooks. And yet the GOP wants further deregulation! Who do they really care about? According to the NIH, Univ of Maine, U of Illinois-Champaign Urbana, Colorado State Univ and others, manure is only safe for food gardens if composted. They also say you should only water food gardens with potable water that meets federal clean water standards. If the water exiting a garden hose exceeds lead safety levels then arguably it's not potable water. My God. Soon schools will be handing out awards to kids for surviving childhood. CHINA SELLS US POISON AND THE US GOVT ALLOWS IT? WHERE IS THE TAXPAYERS PROTECTION? PRESCRIPTIONS AND VITAMINS FROM CHINA HAVE THE SAME JUNK? CHINA CANT EVEN SELL MILK WITHOUT POISON? Alright, so you're new here, country does not nor ever will be concerned with such 'taxpayer' woes. You should probably stop yelling. And who wants to be this stuff was made in........CHINA....What a surprise! And the companies who sell this make extra money because they don't make it here in the US but in that land where cheap labor runs like a garden hose filled with lead! And the companies don't care...they make money! Stop buying stuff that says Made in China. buy American! Stop buying plastic pieces of **** made overseas. Buy something that isn't "disposable" like everything you find at WalMart. Our 'researchers' have blessed us with their expertise again! I believe in them, they are surely the ones who studied the safety of standing on top of our stepladders which resulted in the posting of labels at the top instructing us not to stand there. Also after studying the matter saw to it that for our safety the notice 'do not take internally' must appear on a gallon of paint. So what is dumb about this is that we test this stuff after it is already in the country being sold in stores? We think its such a bad thing and yet I see little being done other then these testing facilities telling me they are unsafe? The question is at what levels are these items when used properly? I don't intend to drink daily out of my hose, or ingest some of my garden tools. I am sure a lot of products have some bad stuff in them. But used normally are they are health problem?Really? Are we talking the same rubber hoses we use for our washing machines? Check out the eczema remedy counter for kids these days. It's big business for a reason. Time to swap out the washer hoses for stainless steel. Does anyone know what Crocs are made of? I find that I cannot wear them anymore, because I get sort of a 'crippled or distorted' sensation in my foot, so I have stopped wearing my Crocs sandles. Now after not having worn them for a while, my feet feel fine again. I really don't know why you would limit this article to gardening tools, this is more about plastics in general. there are a lot of potentially dangerous chemicals in plastics, and it is article worthy, but it deserves to have the scope of the article broadened. Wow, marvelous weblog structure! How long have you ever been running a blog for? you made running a blog glance easy. The total look of your website is wonderful, let alone the content material! very surprise this happening in america any how good move by authorities is appreciated. Gardening is a very good option for relaxation. so save your garden. Gosh! I can't believe gardening tolls can be that toxic. Just show how good is the US authorities. Now, what else is toxic? nfl jerseys 2013 cheap Detroit Lions jerseys moncler pas cher chanel bags Drugs are very important for existence. They play a pivotal role in keeping us healthy and keeping us away from harmful bacteria and other infections. These medicines are used by the people around the world. Steroids are also taken as energy supplements. Superdrol or methasterone is a drug which is used as energy supplement. Energy drugs were primarily developed in the 1950s, their use has been restricted to people with special requirements. Olympic committee and other sports organizations have banned their use and world anti doping agency or WADA tests athletes randomly during the major sporting events. nfl football jerseys cheap Baltimore Ravens jerseys Being familiar with compatible toners recycling is a thing that will not solely benefit you maybe business, nevertheless it will also finally benefit the globe in which most of us live also. There are so many other considerations that you can do to keep the world inside better form than it presently is went, but that is only one point that you have to don't forget to do. Not really throwing away an empty printer ink means that you are doing another small factor to move the healthiness of our Earth in a more positive direction than it it going in at present. Thank you very much for being the advisor in this place. I really liked this post a lot and most of all I enjoyed reading the method that you dealt with the issues I regarded as being dubious. You are always truly kind to site visitors take delight in me and help me into my living. Thanks a lot. To understand your point of view I had to spend a little time reading.